He was the weakest boy in class. He would be down with malaria each year. And, what’s more, he underwent four major surgeries to treat parotid tumour. But from July 2000 when he embarked on a solo run from Haridwar to Baghpat, Arun Bhardwaj has shown reserves of inner strength as he as India’s only ultramarathon runner. He became the first Indian representative in any 24-hour ultramarathon when he logged 138.172km and finished ninth in the IAU Asia 24-hour Track Championships in Taiwan in March 2002. His last major exploit was finishing the Badwater Ultramarathon. Covering 217km non-stop, it is the most demanding and extreme running race offered anywhere on the planet. He believes the world has not dared to look to the real source of all true greatness. Most of us simply do not dare look within ourselves for the unbelievable strength and capacities that sit dormant within us. Our true inner capacities far outshine the dimensions of our minds and bodies. He loves the tears that flows down his cheeks when he in running the ultras, exploring the unknown inner world experiencing spiritual ecstasy. He sleeps just four hours each night and spends one sleepless night every week. For, he clocks 160-200 hours of training each week besides working at the Planning Commission. The 43-year-old’s relentless pursuit of his dreams, fuelled by his indomitable spirit, is inspirational. 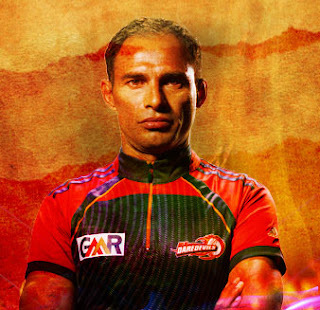 As a wonderful flagbearer of Daredevilry, we are very proud to welcome Arun Bhardwaj as a Delhi Daredevils Super Fan.